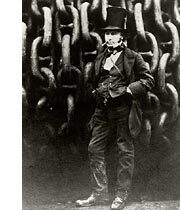 Even without his work on the railways, Brunel's contribution to the development of steam-powered shipping would have earned him a notable place in engineering history. It is in this field that his work most clearly shows the results of his father's influence and the benefits of his own education in mathematics and mechanics, underpinning his ambitious vision. The directors of the Great Western Railway must have been surprised when, in 1835, their new engineer approached them with a proposal to build a passenger steamer which would "extend" their line from Bristol... to New York. At that time, the problem with steam-powered travel across the sea was lack of space onboard to carry sufficient coal for the journey. Brunel's calculations showed, apparently for the first time, that it should be possible to build a steamer with ample capacity to power the Bristol-New York trip. His fascination with steam ships may have derived from his father's experimental musings, but this conclusion was all his own. This apparent tangent was too much for the railway promoters to follow, but a separate group of Bristol merchants took up the idea. Thus, the Great Western Steamship Company was formed and, in 1836, work on Brunel's first steam ship, the Great Western, began. The Great Western was a paddle steamer, built of oak using traditional methods. What was unusual was her size: 236 ft long and 59.8 ft wide across the paddle boxes. Maudslay, Sons & Field produced her engines. She was launched at Bristol on 27 July 1837 and sailed to London for the installation of the engines  all steam ships at the time, and for many years after, were fitted with sails in case the engines failed, to provide extra stability and to save on fuel by making use of favourable winds. On 31 March 1838, on the return to Bristol for the start of her maiden voyage to New York, fire broke out in the engine room and Brunel was seriously injured fighting the flames. Thus, the Great Western did not leave Avonmouth until 8 April. Meanwhile, promoters at the rival ports of Liverpool and London were racing the Bristolians to complete the England-New York crossing under steam power. The British & American Steam Navigation Company of London had adapted an Irish package steamer, the Sirius, for the journey. The Sirius sailed from London on 38 March and reached New York 19 days later, making her the first steam-powered ship to cross the Atlantic. The triumph was shortlived, however: Sirius' crew had had to burn cargo to finish the crossing, and the Great Western was hot on her heels. Crossing the Atlantic in only 15 days and 5 hours, the Great Western dropped anchor off the US coast barely two days later than the Sirius  and what's more, she had almost 200 tons of coal to spare. Brunel's first ship became the first truly viable package steamer, completing 67 crossings over the next eight years. More importantly, the experience of building the Great Western had given Brunel other ideas. His next steamer project, the Great Britain, was designed on an even grander scale, measuring 322ft long  at the time of her launch, the largest ship in the world. Other crucial innovations were incorporated. The Great Britain had a double hull made of iron rather than wood and was propelled by screw propeller rather than paddles. These innovations evolved over a two year period, 1838-40, during which Brunel advised the Admiralty on designs for the world's first screw-propelled naval steamship, the Rattler. Working at  or beyond  the forefront of nascent engineering science, Brunel dedicated months to calculations, controlled tests and the collection of supporting data to produce his final designs. His methodology was as important a contribution to engineering as his results. The Great Britain, like her predecessor, was built in Bristol and owned by the Great Western Steamship Company. She was launched on 19 July 1843 and, after a long and varied life, was brought home to Bristol where she remains today. Brunel's final shipping experiment, the Great Eastern, is variously described as his greatest failure, his most far-sighted vision and the project which killed him. His plan was to build a ship of sufficient volume to make the journey from Britain to Australia without stopping to refuel  and this before the Suez Canal existed. Not only was the Great Eastern  at 692 ft long and a gross tonnage of 18,915 tons  the largest ship ever built (probably ever conceived of) at the time, it was not surpassed in length for 41 years or tonnage for 48. Too large to be propelled by a single screw, the Great Eastern was powered both by screw propulsion and paddles. When the time came to launch her, in November 1857, nothing of a comparable weight had ever been moved across land by man. We cannot know whether Brunel's supporters in Bristol would have stuck with him through this last, most ambitious scheme, for the Great Western Steamship Company had been bankrupted by a disaster involving the Great Britain in 1846. As it was, a new group of promoters formed Great Eastern Steam Navigation Company in 1852. Brunel was appointed engineer and John Scott Russell, a London-based shipbuilder, agreed to construct the Leviathan, as the ship was sometimes called. To accommodate her  she had to be built on land, as no dry dock then existing was large enough  Scott Russell had to expand out of his yard on Burrells Wharf into Napier's yard next door. Brunel continued to experiment and modify his designs throughout the six difficult years that followed, during which the shipbuilder was bankrupted and the company dissolved and reformed. The Great Eastern was finally floated at 3:30am on 31 January 1858 after almost three months of effort just to move her from the blocks. In September 1859 she was ready for her maiden voyage. She steamed down the Thames on 7 September and, the next day, a feed-water engine jacket exploded in her boiler room, killing five stokers. The accident was caused by negligence rather than any fault in design but the result was tragic nonetheless. Brunel died a week later.